As we saw earlier in the construction of Underground cables, a cable is basically a set of one (or three) conductors surrounded by a metallic sheath. This arrangement can be considered as a set of two long, coaxial, cylinders, separated by insulation. 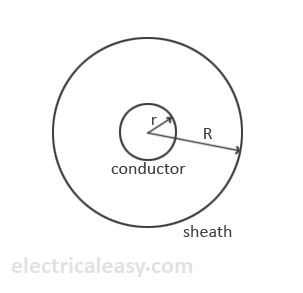 The current carrying conductor forms the inner cylinder while the metallic sheath acts as the outer cylinder. The sheath is grounded, and hence voltage difference appears across the cylinders. The dielectric fills the space between the charged plates (cylinders), making it a capacitor. Hence, capacitance of the cable becomes a very important aspect, and must be calculated. We can broadly classify cables as single-cored and three-cored. And the calculation of capacitance is different for both. A single core cable can be represented as shown below. Consider a cylinder of radius x meters and axial length 1 meter. 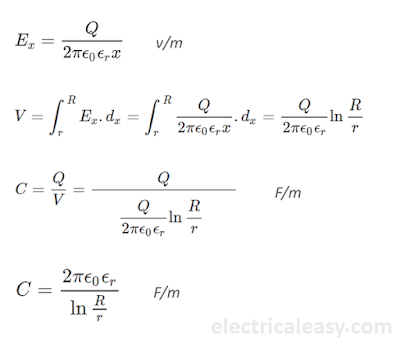 x be such that, r < x < R.
Now, electric intensity Ex at any point P on the considered cylinder is given as shown in the following equations. Then, the potential difference between the conductor and sheath is V, as calculated in equations below. When the capacitance of a cable is known, then its capacitive reactance is given by Xc = 1/(2πfC) Ω. Consider a three cored symmetric underground cable as shown in the following figure (i). Let Cs be the capacitance between any core and the sheath and Cc be the core to core capacitance (i.e. capacitance between any two conductors). In the above figure (ii), the three Cc (core to core capacitance) are delta connected and the core to sheath capacitance Cs are star connected due to the sheath forming a single point N. The circuit in figure (ii) can be simplified as shown in figure (iii). Outer points A, B and C represent cable cores and the point N represents the sheath (shown at the middle for simplification of the circuit). Therefore, the whole three core cable is equivalent to three star connected capacitors each of capacitance Cs + 3Cc as shown in fig. (iii). First, the three cores are connected together and capacitance between the shorted cores and the sheath is measured. Shorting the three cores eliminates all the three Cc capacitors, leaving the three Cs capacitors in parallel. Therefore, if C1 is the now measured capacitance, Cs can be calculated as, Cs = C1/3. In the second measurement, any two cores and the sheath are connected together and the capacitance between them and the remaining core is measured. If C2 is the measured capacitance, then C2 = 2Cc+Cs (imagine the above figure (iii) in which points A, B and N are short circuited). Now, as the value of Cs is known from the first measurement, Cc can be calculated. We know that capacitance is inversely proportional to separation between plates. Hence, if the separation between the plates is large, capacitance will be less. This is the case in Overhead Lines where two conductors are separated by several meters. The converse, of course, is also true. If the separation is small, the capacitance is more. In Underground cables, obviously, the separation is relatively smaller. Hence capacitance of underground cables is much more than that of Overhead lines. The most important factor that is affected by this is the Ferranti effect. It is more pronounced in cables than in lines. This induces several limitations. Also, with increased capacitance, the charging current drawn is also increased. Underground cables have 20 to 75 times the line charging current compared to Overhead lines. Due to these two conditions, the length of Underground cables is limited.